Due to popular demand, many of our stand up pouches will start coming with a round hang hole. You can look up which items will be getting a round hang hole in this table and in an announcement on the individual item page. 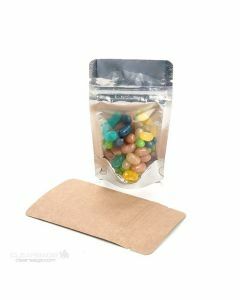 Display packaging is a crucial component in making sales, and zipper pouch bags are the perfect display packaging option. These easy to use pouches stand on their own. They make excellent protection that keeps food extremely fresh, as each bag varies between 2.5 – 6 mil thickness. High Clarity — High barrier bags that easily showcases your products. Color Backed — High barrier bags that protect your food and makes for memorable displays. Metallic — Higher barrier bags with multiple metallic colors that make an impact. Kraft — Medium barrier bags made from durable lined Kraft paper. Oval Window — Medium barrier stand up pouches with beautiful, clear windows. Rice Paper — Medium barrier with elegant swirl patterns, no 2 bags are alike. Matte Frosted — Showcase your product in these elegant frost patterned zipper bags. New! Eco Zipper Bags — Airtight resealable zipper bags made from 100% compostable materials. These types of bags can also easily be branded with your logo if necessary, and are a great choice for chocolates, coffees, nuts, trail mixes and more. 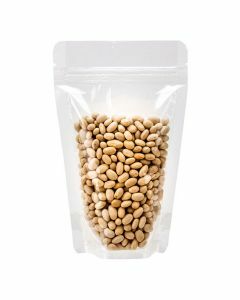 With many of these bags available for less than $0.20 each, these wholesale pouch bags won’t hurt your bottom line while still providing incredible value. Find your food display packaging at ClearBags®. 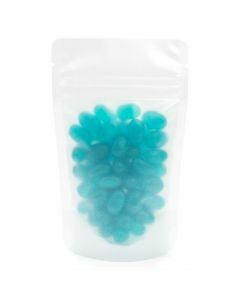 Perfect for giveaway sampler packs or single-serve items, our ZBGB1TL stand up pouch holds 1 oz/28 g. This zipper pouch comes in bright teal and has a clear front panel to showcase your product. Package candy, coffee, powdered mixes, nuts, and more. 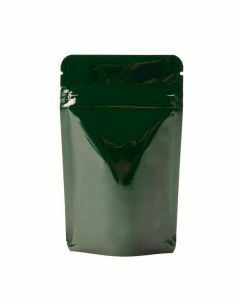 This pouch measures 3 1/8" x 2" x 5 1/8" has a resealable zipper closure and round hang hole for the retail environment. 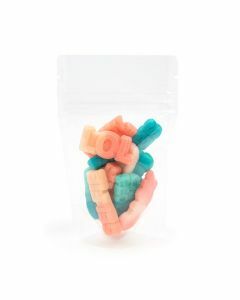 Keep candy and snacks fresh in our high barrier stand up zipper pouches. Our ZBGB1VL pouch comes in a bright violet color and is designed with a clear front panel to show what's inside. Package candy, cookies, snacks, sea salts, coffee, and more. This pouch measures 3 1/8" x 2" x 5 1/8" and holds 1 oz/28 g. Food safe and heat sealable. Retail ready! Set the mood with the metallic pink accent of this stand up zipper pouch. Our ZBGB1PK pouch is designed with a clear front panel, a pink back, and is pink inside. At 3 1/8" x 2" x 5 1/8", this pouch holds 1oz/28g. FIll this pouch with single servings of coffee, tea, mints, chocolates, and more. Features a resealable zipper, tear notches, and a round hang hole for retail. 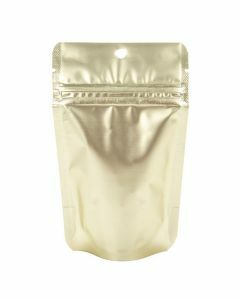 Get a fancy look for single serve items with this stand up pouch in matte gold. 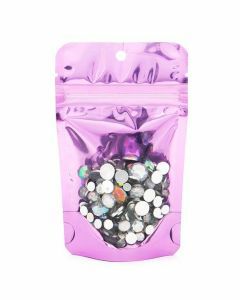 Our ZBGM1MG pouch measures 3 1/8" x 2" x 5 1/8" and holds 1 ounce/28 grams. 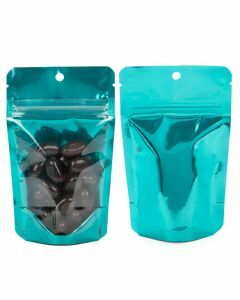 Fill this resealable pouch with ground coffee, candy, snacks, and more. A high barrier keeps your products fresh. This food safe pouch features a round hang hole and tear notches. Our ZBGMG1 zipper pouch is designed in a matte gold color with a clear front panel. 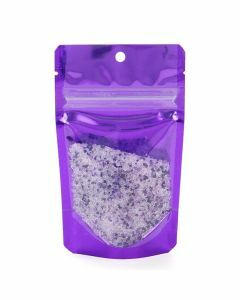 Ideal for single-serve portions, this pouch has a usable space of 2 11/16" x 1 3/4" x 3 3/4" and holds 1 oz/28 g. Fill with coffee, sea salts, small candy, spices, and more. A high barrier seals in aromas and flavors. Food safe. 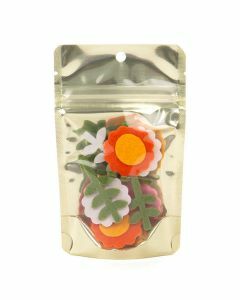 This frosted stand up pouch offers an elegant touch that is sure to attract customers. The ZBGF1 measures 3 1/8" x 2" x 5 1/8" and holds 1 oz/28 gr. Perfect for single servings, package coffee, tea, sea salts, candy, and more. Features include thick 5.5 mil semi-transparent material, high barrier protection, and a resealable zip lock closure. This item is currently sold with NO HANG HOLE. Due to popular demand, it will soon come stock with a round hang hole. Check this table to see when it will be available with the hang hole. Our ZBGCC1 clear stand up zipper pouch is the perfect solution for when you need extra durability in your packaging. This single serve pouch measures 3 1/8" x 2" x 5 1/8" and holds 1oz/28g. Package small treats, sea salts, spices, taffy, and more. The thick, high clarity laminated 4 mil material provides an excellent protective barrier. This item is currently sold with NO HANG HOLE. Due to popular demand, it will soon come stock with a round hang hole. Check this table to see when it will be available with the hang hole.